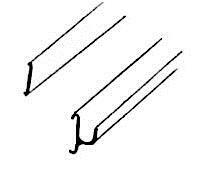 Rain gutter, aluminum, 2 piece style, 4 pieces to a set, coupe. Rain gutter, aluminum, Coupe. This is a two piece style rain gutter. One piece attaches to the side of the top and the gutter piece snaps onto it. 4 pieces to a set. (one set per car). This replacement part is not the original style, but does the job. It is the only style being reproduced.